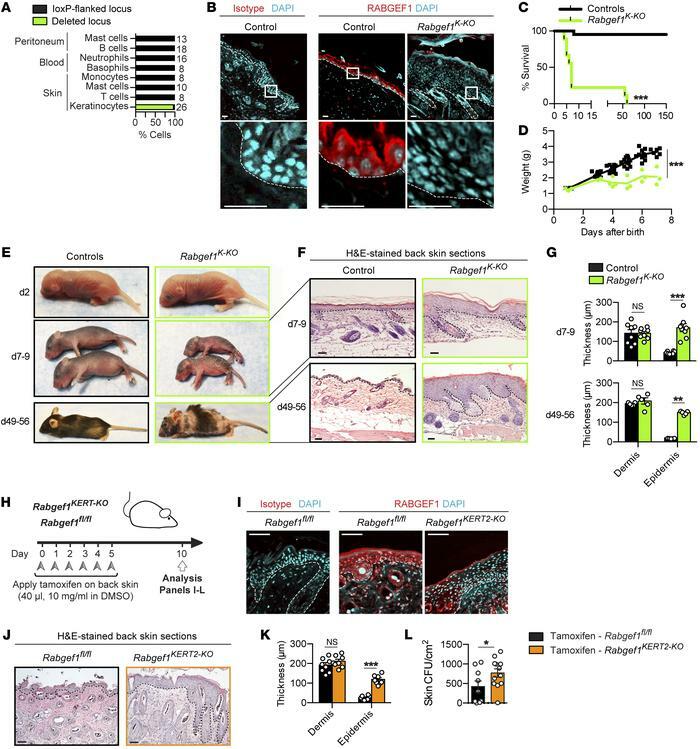 Role of keratinocyte-intrinsic Rabgef1 in health and skin homeostasis. (A) Specificity and efficiency of Cre-mediated Rabgef1 deletion assessed by single-cell PCR; numerals indicate the number of single cells analyzed, and results are pooled from 2 separate experiments. (B–G) Comparison between Rabgef1K-KO and control mice. (B) Representative RABGEF1 staining of back skin sections from adult mice. (C) Survival (n = 9 and 29, respectively) and (D) body weight (n = 8 and 18, respectively) over time in Rabgef1K-KO and control mice. (E) Representative photographs at day 1–2, day 7–9, and day 49–56 after birth. (F) Representative H&E staining of back skin sections. (G) Bars show quantification of dermal and epidermal thickness (n = 5–7 mice per group). (H) Experimental outline for tamoxifen-induced Rabgef1 deletion in Rabgef1KERT2-KO mice. (I–L) Comparison between tamoxifen-treated Rabgef1fl/fl and Rabgef1KERT2-KO mice. Representative H&E staining (I) and RABGEF1 staining (J) of back skin sections. (K) Bars show quantification of dermal and epidermal thickness (n = 7–8 mice per group, 2 independent experiments). (L) Bacterial CFU counts per cm2 of skin area (n = 9–12 per group, 3 independent experiments). (B, E, F, and I) Pictures are representative of more than 5 samples analyzed per group, and (I and J) 3 independent experiments, each giving similar results. (G, K, and L) Data shown are mean ± SEM, as well as individual values. (B, F, I, and J) Dashed lines identify the dermal-epidermal junction. P values were calculated by Mantel-Cox test (C), 1-way ANOVA (D), 2-way ANOVA with Bonferroni’s test for multiple comparisons (G and K), or Mann-Whitney test (L). *P < 0.05; **P < 0.01; ***P < 0.001. Scale bars: 50 μm; original magnification in B and I, ×20; NS, not significant.